In a Houston Chronicle op-ed, Perry endorsed two measures moving through the Texas Legislature: one that would seal certain offenders' records and another that seeks to make the grand jury process more fair. Editor's note: This story was updated on May 19 to reflect changes the Senate Criminal Justice Committee made to Senate Bill 1424. 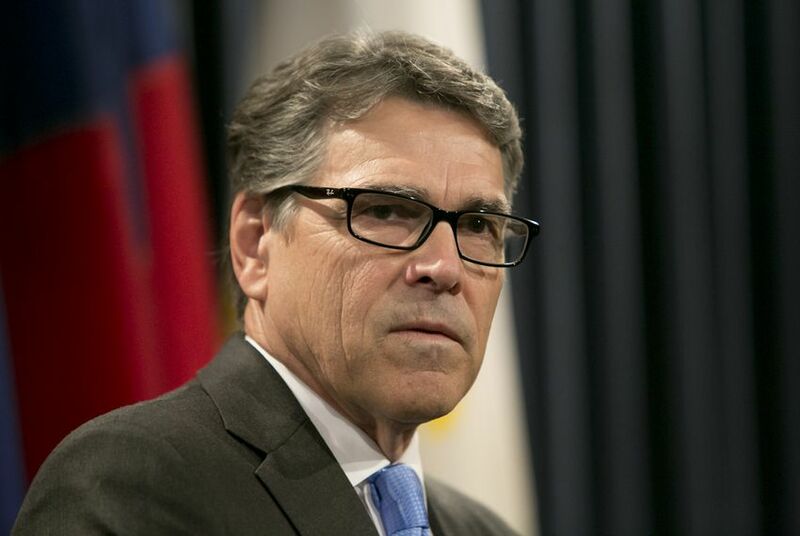 U.S. Energy Secretary Rick Perry entered into politics in his home state again this week, while touting his efforts on criminal justice reform during his tenure as Texas governor. In a Houston Chronicle op-ed, Perry endorsed two measures moving through the Texas Legislature: one that would seal offenders' records for some crimes and another that seeks to make the grand jury process more fair for people under investigation. Perry wrote that he was at first skeptical about criminal justice reform efforts proposed while he was governor but eventually recognized the virtues — and costs savings — that came with understanding and treating the underlying cause of crime instead of just locking away offenders. Perry wrote that Texas officials had estimated in 2007 that the state needed thousands of new prison beds; instead, the state put the money it would have spent on prison construction toward expanding treatment programs. "Incarceration rates fell, while, and most important, crime rates continued to fall more than the national average," Perry said. "Parolees were committing fewer offenses while being better-supervised due to more specialized and lower caseloads for officers; revocation rates for probationers fell as well." Now, Texas should place its crosshairs on the front end of the system and the point when an offender tries to rebuild their life after being released, the former governor said. He points to two bills: Senate Bill 1424, by state Sen. Dawn Buckingham, R-Lakeway, and House Bill 3016, by state Rep. Senfronia Thompson, D-Houston. Buckingham's grand jury reform bill, which Thompson sponsored in the House, would originally have allowed suspects' attorneys to be present during questioning and prevent prosecutors from going to another grand jury if the first one declines to indict – unless there's new evidence. The Senate Criminal Justice Committee approved a revised version of the bill earlier this week. That version would only require a prosecutor receive judicial approval before bringing a case back to a grand jury after one had already declined to indict. The bill could reach the full Senate as soon as Friday. Thompson's bill would allow some first-time, low-level offenders to seal their criminal records, a move that makes it easier to apply for jobs. The bill overwhelmingly passed in the House, and the Senate Criminal Justice Committee held a hearing on the legislation earlier this week. "If we are going to require a person to be penalized for a mistake they have made, once that penalty is over with, they have fulfilled the obligations of that penalty," Thompson said. "They ought to be given an opportunity to make a living. They ought to be given an opportunity to have a place to live." Perry's public support of the two measures seems at odds with U.S. Attorney General Jeff Sessions, who issued a May 10 memo directing federal prosecutors to pursue tough sentencing, according to an article in The New York Times. In the directive, Sessions told prosecutors to pursue mandatory minimum sentences, a policy that rolls back Obama-era practices. The Department of Justice would not comment on Perry's op-ed, but defended Sessions' directive. "The directives in the memo guarantee that prosecutors treat all defendants fairly, equitably, and uniformly and that the charges that a defendant faces should not depend on the particular prosecutor who charges the case nor the district in which charges are brought," Justice Department spokesman Ian Prior told The Texas Tribune. "Further, this policy was formulated after extensive consultation with Assistant United States Attorneys at both the trial and appellate level, as well as former United States Attorneys and Main Justice Attorneys." Perry's stance is not a tough-on-crime position, Thompson said. "The person's already paid for their crime," she said. "Are you going to punish them for the rest of their lives? I think it makes good sense to say that this person should have a second chance, and they ought to be reintegrated back into society." U.S. Rep. Joaquin Castro, D-San Antonio, told the Tribune that he hadn't read Perry's op-ed but thought Sessions' "ideas about returning to, especially harsh drug laws, were a throwback to the 1980s and haven't proven very successful over the last few decades." "I do think the federal government has a role in establishing criminal justice reforms, that there could be a very positive and bipartisan effort from our nation's Capitol," he said. "The states, of course, have incredible purview over state criminal laws," Castro said. "So I think there's a role for both state and federal governments." A bill aimed granting more defendants release from jail without paying bail would require judges to use a risk assessment system before making bail decisions — and to make those decisions within 48 hours of an arrest. Critics say civil asset forfeiture deprives citizens of property without due process. Law enforcement officials say they are stopping crime.